Today I have a secret recipe for a classic dish served at Long John Silver’s. The deep fried cod is one of the most popular dishes on the Long John Silver’s menu. 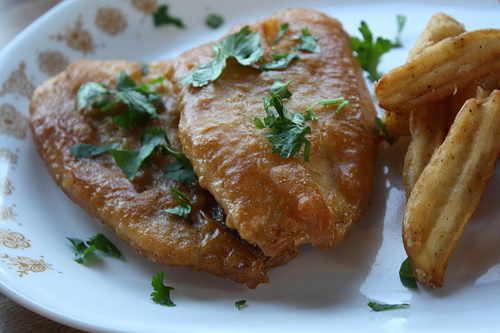 Pieces of cod are dipped in a seasoned batter and then fried to a golden-brown. You can also use this recipe to fry tilapia, halibut or hake as well. If you are not using a fryer, heat up 8 cups of vegetable oil in a heavy pot until the temperature reaches 350 degrees. Make the batter by combining flour, corn starch, sugar, salt, baking powder, baking soda, onion salt, paprika, ground black pepper. Stir to combine all dry ingredients. Add club soda to dry ingredients. The batter will foam, continue to stir. Drop pieces of fish into the batter. Coat fish with batter, drop into hot oil. Fry fish for 2 to 3 minutes or until the batter is golden and the fish pieces begin to float to the top of the oil. Drain fish on a wire rack. 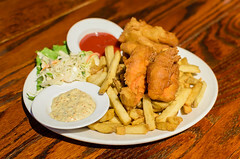 Today’s secret recipe will show you how to make a classic fish and chips meal. Long John Silver’s deep fried fish uses the perfect batter to coat the fish, then fried to a golden-brown. You can use cod, haddock, pollock, halibut or tilapia for this dish. Serve with some malt vinegar on the side. Combine all dry ingredients and sift into a medium sized bowl. Dip fish in batter until completely covered-let excess batter drip off. Deep fry at 375 degrees F until golden brown. 1) The “Almost Sugar” That’s Actually GOOD for You!